Preferences of Chinese college graduates for employment have been changing in recent years as the country undergoes transformations in its economic and industrial structure, a recent survey found. Knowledge-intensive industries such as information, education and healthcare are hiring more college graduates, while labor-intensive ones such as architecture and manufacturing, are losing their appeal to job hunters, according to the College Graduates' Employment Annual Report. The survey, which was released on Sunday by education data and consulting company MyCOS, polled more than 250,000 college students who graduated in 2015. Guo Jiao, deputy director of the MyCOS Research Institute, said the upgrading of industries comes with a need for workers with a higher education. Information technology, for example, is leading the current industrial upgrade in China and has become an engine of economic growth. Reflected in college graduates' employment, Guo said the proportion of graduates who chose to work in media, information and telecommunication rose from 8.5 percent in 2010 to 10.5 percent in 2015. 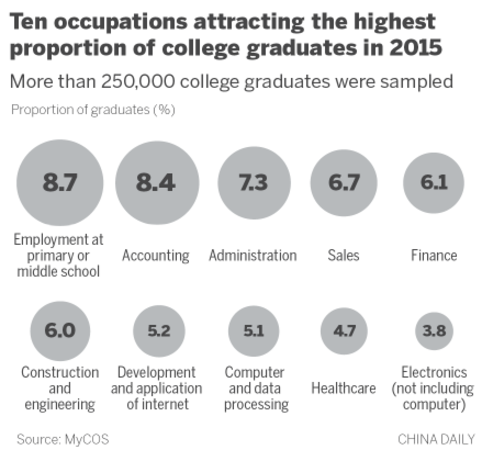 "College graduates' employment is like a barometer, helping decision-makers to differentiate fast-developing emerging industries from those that are declining or facing challenges," Guo said. The report, in its eighth year, also found that small and medium-sized private companies and enterprises, as employers, are gaining increasing favor from college graduates, compared with State-owned enterprises or transnational counterparts. The proportion of college graduates who landed jobs at small and medium-sized private companies rose from 45 percent in 2013 to 52 percent in 2015, while the proportion of those who found jobs in the other corporations dropped. Guo said the changes indicate that State-owned enterprises are making some adjustments to their capacity, and transnational corporations are facing pressure from rising labor costs. The report also found that the employment rate of college graduates has remained comparatively stable despite the slowing economy. 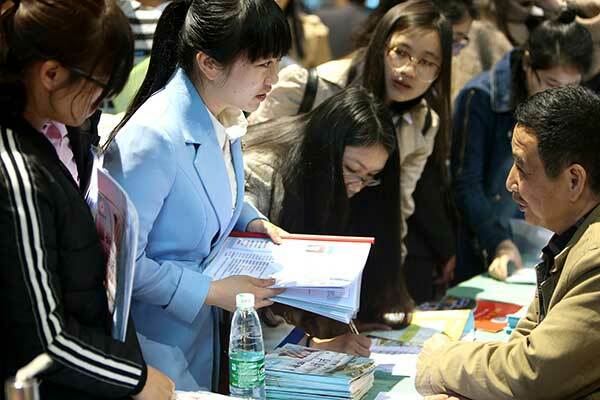 Wang Boqing, founder of MyCOS and an expert on college graduate employment, said the stability resulted from the rising proportion of graduates choosing to start their own businesses and those choosing postgraduate studies. According to the National Bureau of Statistics, among the 6.81 million college students who graduated in 2015, about 204,000 college graduates, or 3 percent, chose to start their own business, a 0.1 percentage point rise from 2014.